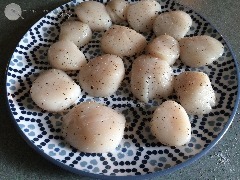 Rinse scallops in water and dry with a paper towl. If you are buying fresh scallops the side muscle may still be intact, simply pull it off before cooking (it will be chewy, and not great to eat). Heat a large skillet over medium/high heat. Melt 1 tablespoon butter with 1/2 tablespoon crushed garlic. 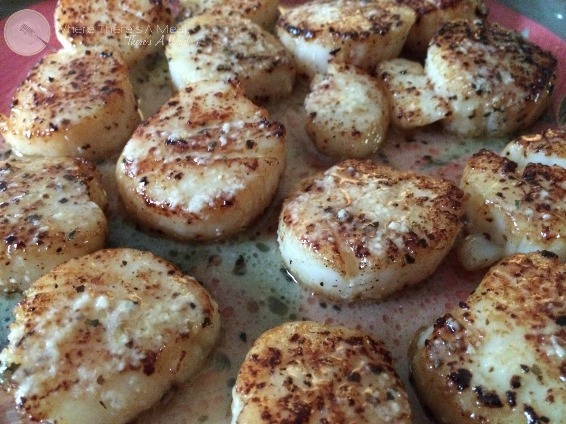 Cook scallops half pound at a time (so you don't over crowd the pan). 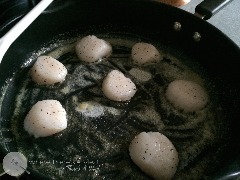 Sear scallops for about 1-2 minutes each side or until they have a nice brown color on them. Once you have cooked all the scallops in the same pan heat remaining 1 tablespoon butter and 1/2 tablespoon crushed garlic. Whisk in lemon juice and white wine. Finally wisk in salt, pepper and basil. 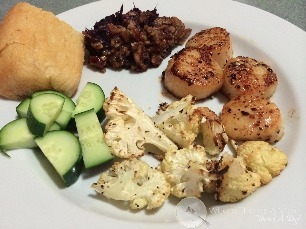 Pour sauce over seared scallops and serve. 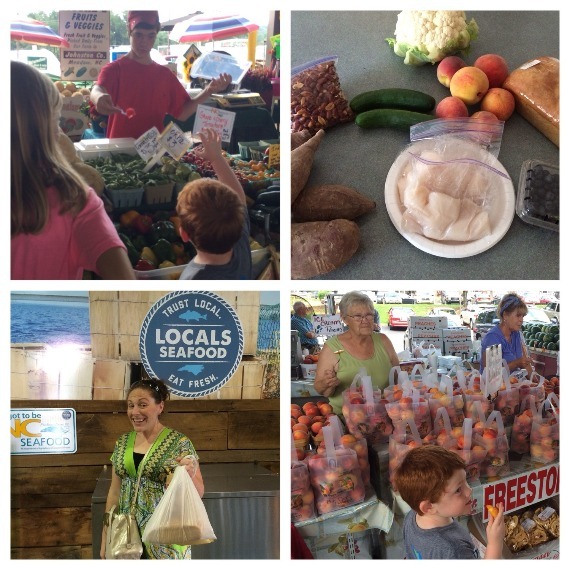 Last week Tucker and I visited our local Farmer's Market. The goal of our visit....find ingredients to make dinner, plain and simple. I wanted my ingredients to be just that...plain and simple...local, fresh, nothing processed. We started out with the produce. I let Tucker pick out anything he wanted to. He could sample anything and I would purchase him any fruit or vegetable he wanted for our dinner. He picked cauliflower, purple sweet potatoes (something we've never tried), cucumber, peaches and blueberries. Next the sour dough bread at the North Carolina Farmer's Market in Raleigh, is simply the best ever, so that was my treat for dinner. Then I had to find a protein. Local's Seafood booth was more than happy to help us! We ended up with some of the most delicious scallops I've ever had (probably had something to do with the fact that they were in the ocean days before they were swimmin' in our bellies). 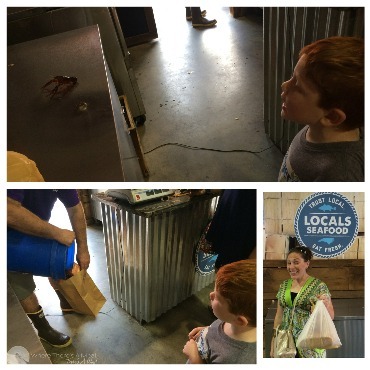 They also had some fresh (live) crawfish out on display. Who needs an aquarium when you can go to your local farmer's market? Tucker was fascinated with these little guys, but didn't like that they had pinchers, and was quite happy when we told him that they would get eaten that night (that's a good thing right?) Using the tips from all the vendors, I got to work to make our delicious fresh meal. Our appetizer was sliced cucumber. Then on to the main course. The lightly seared sea scallops were out of this world. The roasted cauliflower was a favorite of Joe and Tucker (I tried it, and I think I'll stick to mashed cauliflower...not a fan of the texture). 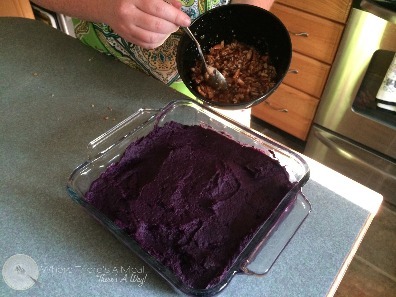 My purple sweet potato casserole looked like something out of a Dr. Seuss book (in the best way possible) whimsical and tasty. Then to finish it all off, a slice of scratch made sour dough bread, and fresh fruit. I mean what can top that? Looking for some dinner inspiration, check out your local farmer's market because where there's a meal, there's a way!